Turner's Tokens: Chance to Win a Mechanics of Love Necklace! Want a chance to win one of the Mechanics of Love Necklaces? 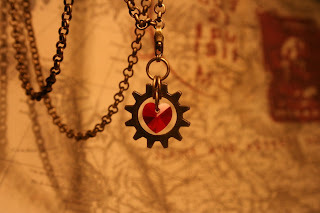 Leave a comment on this blog entry telling me what you love about steampunk and you are entered! Make sure you leave a way to be contacted, like your e-mail. If you are under 18, please make sure your parents approve of you entering this contest. I will ship internationally so anyone can enter! Names will be entered into a random list generator at random.org and the person that comes in first wins. The drawing will take place on February 13th @ 9pm CST and results will be posted soon after. What I love about steampunk is the variety of people that get drawn into it and seeing the different ways it is interpreted. Steampunk doesn't have just one deffinition, maybe extremely loose guidelines if that, and it is left up to the fantasy of those involved. Don't forget to check out the shop while you wait for the results! What I love about steampunk, is the way rusty looking parts of mechanics become usefull and pretty in their own way. Old looking pipes become important to the machines. like your jewelry, it gets that ''sparkling'' touch, tough the colours are just brown. I love just the idea of steampunk jewelry, because it's very original, and very nice looking. I love that steampunk combines the fabulously raw industrial nature of the Victorian era, with the limitless fantasy and technology of the future. It's like the perfect mix of fashion AND function. Cogs, gears, and gadgets galore! I love steampunk because it makes me feel beatiful and womanly when i dress up. It makes me feel happy and special. It lets my creative side go wild and my girly side take hold. I like the variety of metallics and how they're combined together with natural materials. Matte cogs with colorful feathers, bones and leather combined with watch parts and vials, gadgets and leather with crystals. I just find it very interesting. I also love that steampunk and cyberpunk are so very closely related and may be combined together. I'm more cyberpunk than steampunk myself, but I love the look both offer. I love the costumes. They can get so crazy elaborate, and they can vary so much depending on the person's character. I enjoy the multi-faceted rich culture that has bloomed from a literary genre. The beauty of a bygone era combined with the inspiration of modern minds. But I think that most of all I love the amazing people who are a part of this steampunk culture, so inviting, so intriguing, so creative, so wonderful. I love steampunk because there's just something really fun about it. I love the whole concept and some of the concepts are so cool. I really don't have much to say about Steampunk yet because I just got into the fandom not too long ago because of the items you make and a movie called "Steamboy". But I have really started to love all of the ideas that people can come up with, with the Steampunk idea. What I love about Steampunk is how it mixed two sorts of worlds in a classy and absolutely appealing way. Its plausible in all its parts whether it is inventions or apparel, and as your work shows jewelry too. Its just incredible. What I love about steampunk is the community. We're not all makers or like-minded, but for the most part, you can carry on conversations at length with just about any of them about some splendidly twisted piece of plastic you found in a parking lot, or how wonderful this or that thrift store is, or about the fantastic deal you got on Ebay for a dirty tophat. I love how there is so much VARIETY in steam punk styles. Yet I can find something absolutely beautiful about each one. I can't think of any other style that can utilize such great stuff and still be considered the same 'genre'. :) That's what I love about your work too! You explore so many different techniques and such. What I love about Steampunk are the endless possibilities - historical, technological, creative, fashion, literary, and visual. I love that the people in the steampunk niche tend to be so friendly and informative. Definitely one of the more welcoming fandoms I've come across. Well, that and all the clothes are so pretty. I love steampunk because it brings back a sense of freedom. There's freedom socially, of course, with costumes and characters and such, but also mechanical freedom. I love the beauty of the mechanism, of bringing a fantasy to life without digital displays or complicated circuitry or computers. It's pure. I'm trying to figure out how I haven't seen this blog yet XD. Turner, I love your pieces. I can't wait to see what else you come up with this year! Keep up the good work girl! Ever since I was a kid I have loved the stories that involved futuristic technologies in the past...I never had a name for that until about last year. Steampunk! I love the concepts that are born from it. Endless ways to make our technological world become real within the beauty of the past. For the artists, it opens a new medium to play in and for the techies it opens the opportunity to rethink how these things have come to be. There's High Fantasy, Low Fantasy, Science Fiction, Urban Fantasy... Steampunk is another genre of fantasy to get lost in. And I love fantasy. What draws me to Steampunk is the sheer richness of the setting. There seems to be a certain classiness to it (in "traditional" steampunk-alternate-history settings), and it appeals to me. For steampunk tales set in a new world however, its the various ways that they incorporate the ideas and so called "mechanics" of a Steampunk world and place it within the new setting that intrigues me when done well. What i love about steampunk is the melding of vintage and technological elements, also there are so many variations of steampunk that almost everyone can identify or like one certain aspect of the generalized "steampunk" style.